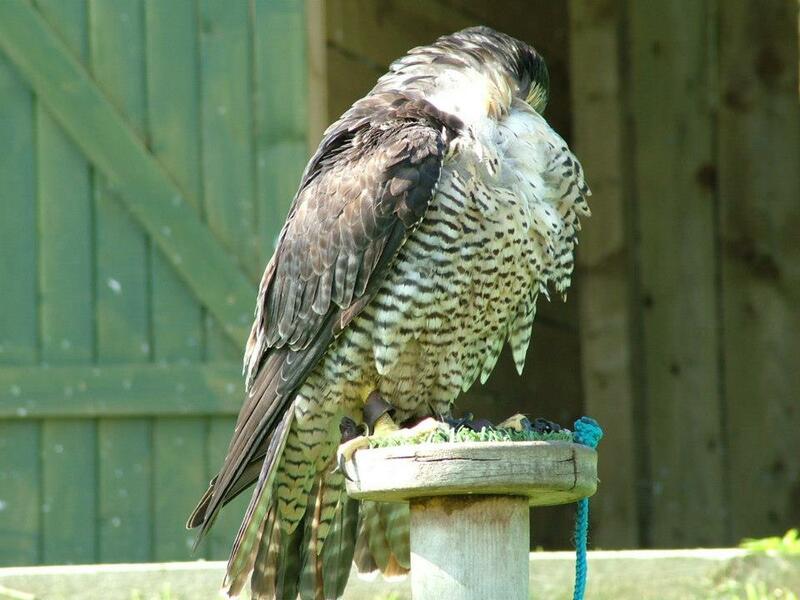 One of our most popular birds, and a personal favourite of mine, Fletcher the peregrine, has died suddenly from a heart attack. It’s a big loss for us, but losses are inevitable, of course. However, Fletcher’s death was really unusual, as I’ll describe for you later in this post. 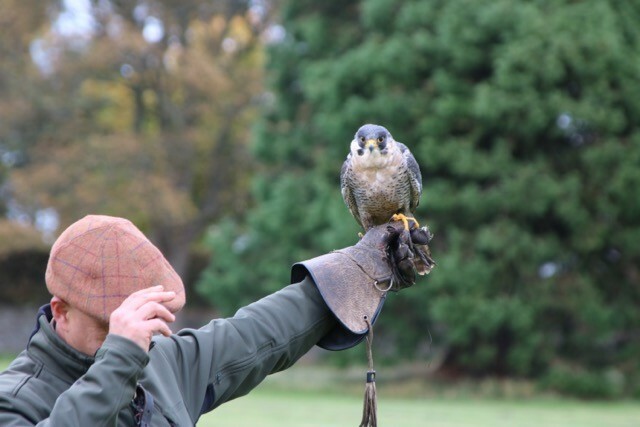 First, a little look back at Fletcher’s life and career with the Scottish Countryman | Inspired Falconry team. 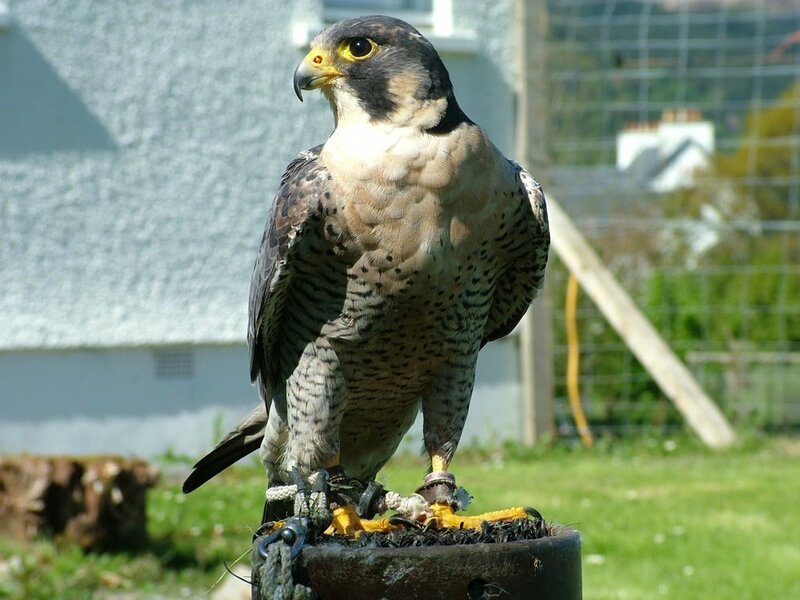 Many of you know Fletcher well, having attended one of Steve’s displays at Strontian, Resipole, Fort William, Evanton, Kinlochard, Falkland, Craigtoun, Kirkcaldy, Lower Largo, Bellwade, or maybe you’ve enjoyed a bird of prey experience at our base, first at Pitscottie and now near Crail. If so, you’ll have met Fletcher because he was a popular member of our team and a key member since Inspired Falconry started. 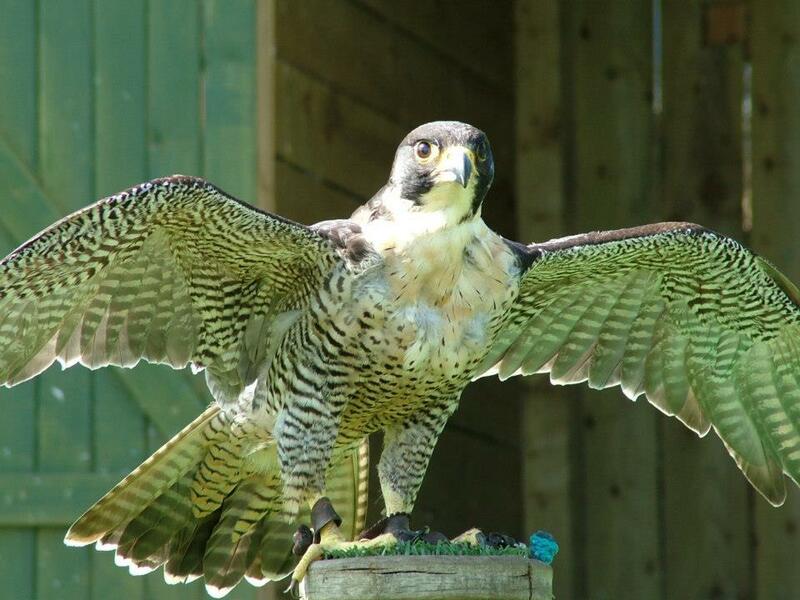 Steve bought Fletcher at just 10 weeks of age in 2007, from a falconer in the north of England. We named him Fletcher after the arrow-makers of medieval times (the feathers at the end of the arrow, that make it fly straighter and further, is called a ‘fletch’, hence a ‘fletcher’). If you’ve seen Fletcher in a fast stoop, or watched peregrines on TV, you’ll probably have seen the arrow-head shape that they make when they dive vertically to catch their prey. I took these images of Fletch at Laudale, probably in 2009 or 2010. Fletcher trained most days with Steve, when the weather would allow, and they became very comfortable with and confident in each other, getting to know their routine. Fletch was never the classiest eater, however, and Steve had to apologise for his wheezy, awkward eating style on several occasions; it certainly wasn’t something you wanted to see if you were about to eat! When Steve moved the business across to Fife in 2011, Fletcher quickly settled in to his new flying ground, working at our base in Pitscottie and also on a short-term pest-control contract in Perthshire. He was a big hit at the displays Steve was invited to do at nearby Craigtoun Park, and at the summer fete in Lower Largo. Through these middle years, Fletcher’s plumage was stunning - that rich, slate grey and a gorgeous golden eye-surround, seer and feet. He was healthy, fit and full of vigour. 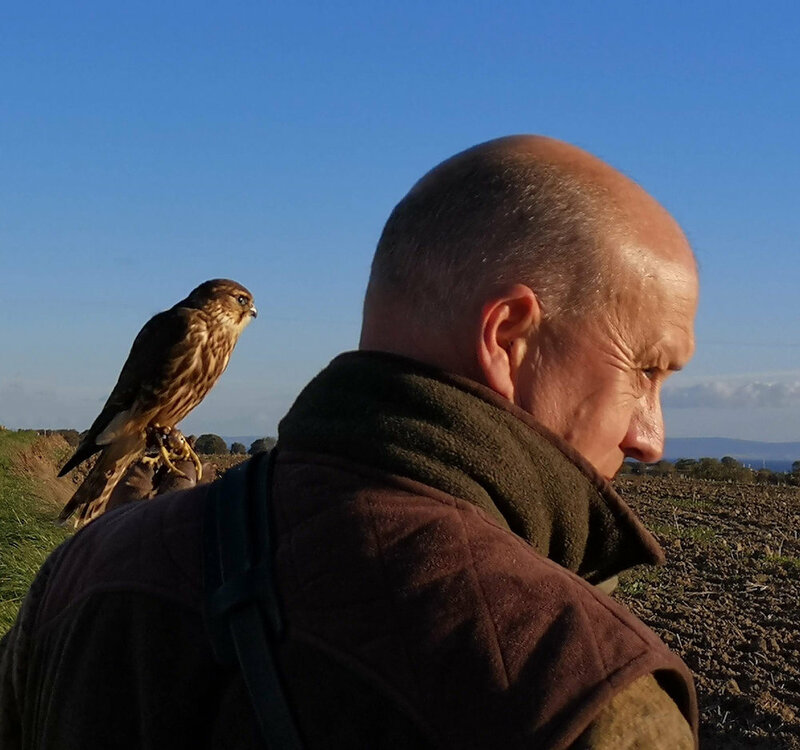 As you may know, Steve started out as a game-hawker, working initially with a buzzard to learn his falconry, but always with the aim of flying a Scottish peregrine, the ultimate British falcon and prized around the world for its speed and prowess in the air. 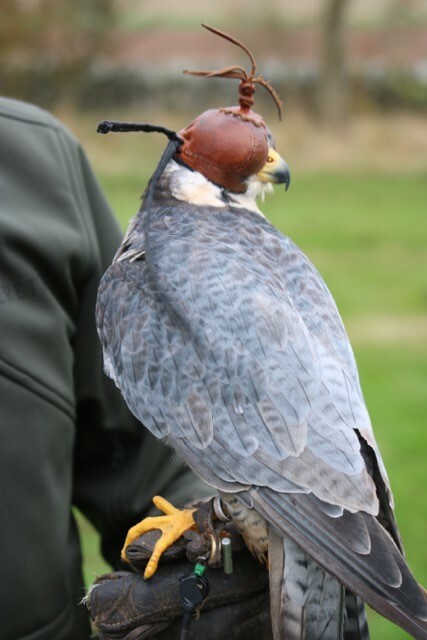 In more than 30 years as a falconer, Steve has been lucky enough to experience some exceptional game-hawking with peregrines, notably a tiercel named Miller and a falcon called Midge, but it is Fletcher, the lure-bound peregrine, that - over almost 12 years of service - has introduced thousands of people to this exceptional species. Steve really enjoyed flying Fletcher. He was, in the main, bomb-proof, dependable. He was always happy to fly, even if the weather was bad, the wind gusting or swirling, even if the crowds were close or huge (like the many hundreds at Fort William’s Highland Games), even if he wasn’t at his optimum flying weight - it didn’t matter. And the reason he was so reliable, so great, is that he absolutely loved working with Steve: Fletcher loved his job! Fletcher was a fast, assured, intense flyer with the slickest of turns; he was a full-on showman with a strategically low, cheeky dip mid-display that saw him skim just inches above the heads of his audience, making them all duck and whoop and smile! Fletcher was a real crowd-pleaser, but he would fly that way with or without a crowd - he just loved his matador-style lure contests with Steve and, as you can tell from the photos, Steve loved to see him fly. Just last month, we posted this on our facebook page, showcasing some great photos that Wendy Dury took of Fletcher during her bird of prey experience. 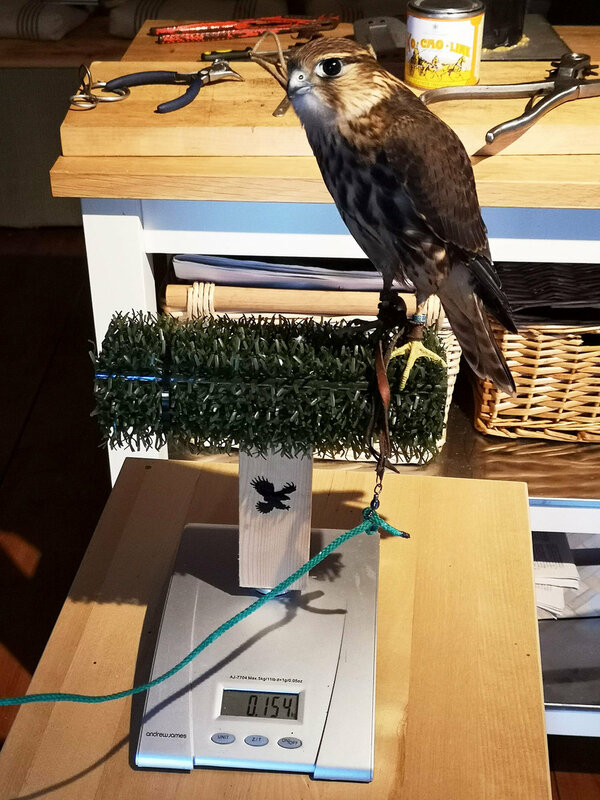 Here is the full set of images, showing Fletcher in his hood, pre-flight, his pre-flight checks on Steve’s raised glove, and his post-flight feed. You can tell he’s a mature bird: he looks older. He was getting old. Last week, just after a fantastic, characteristically energetic and enthralling lure flight with Steve, Fletcher landed and Steve retrieved him from the lure. Fletcher was eating his reward, a piece of chicken meat provided to him by Steve, when he stretched a little, looked up at Steve and then closed his eyes and fell gently sideways. Stone-dead, from a heart attack. The chances of Fletch having a heart attack whilst Steve still had him on the glove are incredibly small, but his remarkable end seems entirely fitting for a true foot-soldier of Steve’s business. As you will remember if you ever saw them fly together, Steve and Fletcher had a bond; they worked together for a long time and they knew each other well. Fletcher was there from the very start and he’s been a brilliant asset and talisman for the team. We had the delight of seeing him fly for 12 years and we will always remember him very fondly. 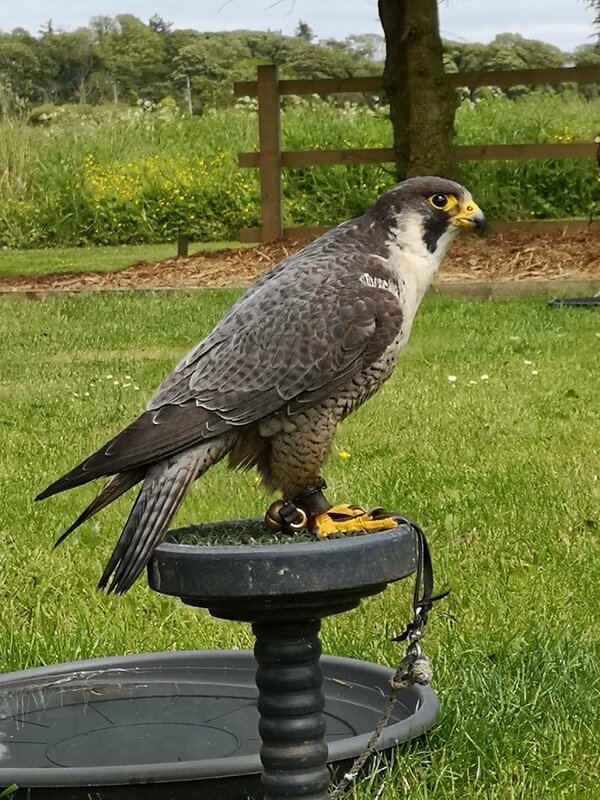 This spring and summer, if you visit The Scottish Countryman’s base, you’ll see Steve’s small memorial to Fletcher the Scottish peregrine. You’ll also (hopefully) see his successor in the team, young Logan, who’s currently under training with Steve. photo by victoria warren: Fletcher in feather-perfect full flight. 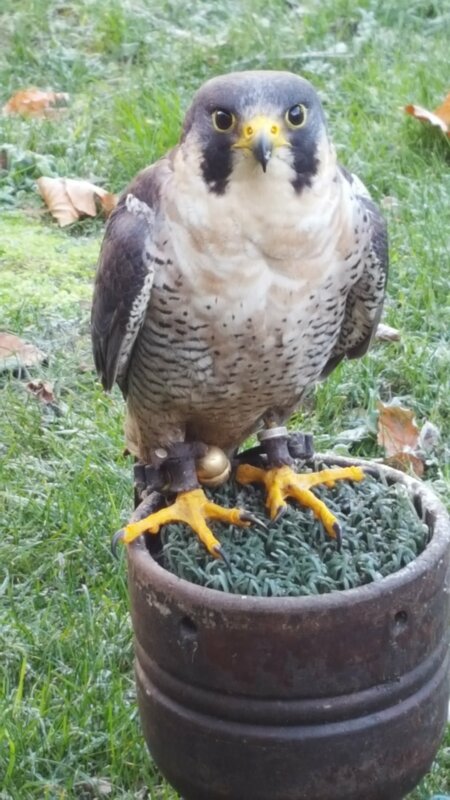 Fletcher, our Scottish peregrine: 2007 - 2019. If you ever met Fletcher or saw him at one of Steve’s displays, will you please share you memories in a comment below? We’d love to hear them. Researcher and collector of information, learner, observer. Interested in a balanced lifestyle, books, stationery, self-improvement, the countryside, expertise, cricket, big-occasion sports events, wild spaces, photography, travelling, donkeys, bees, ducks and hens, drinking less and experiencing more. 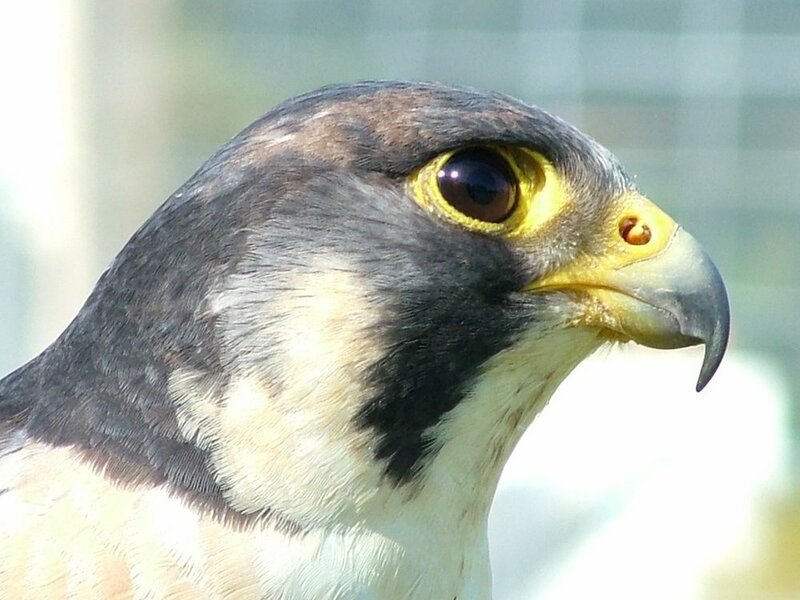 Merlins are the smallest falcon native to the UK and, as you may already know, in birds of prey, the males are always smaller than the females. Our male merlin Jim is a tiny bird. He stands about 6 inches tall (15cm) and weighs in at only 5oz or 155g, approximately. 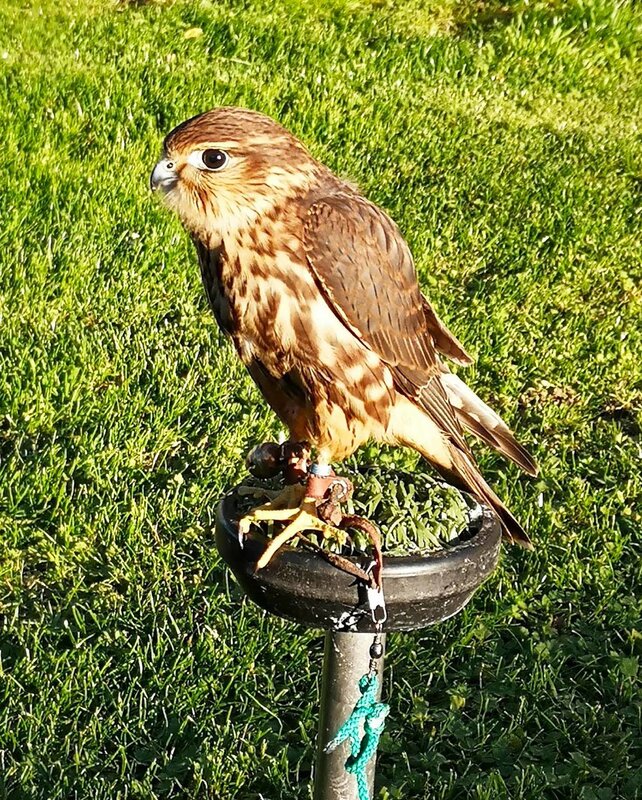 We got Jim in August from a top quality breeder of merlins based in N/E England. 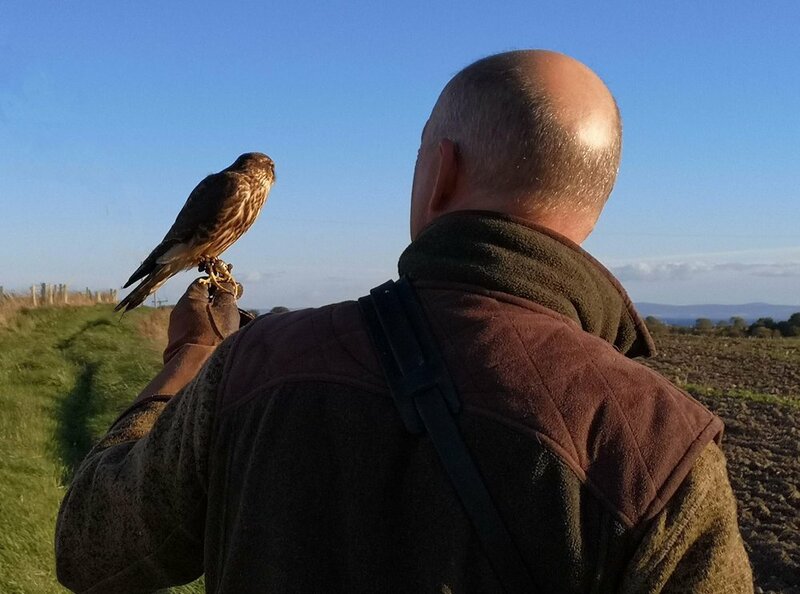 Steve has always loved merlins; he used to breed merlins about 25 years ago so he was delighted to have a wee falcon again and keen to get going with it. “Getting going” with a new falcon means spending a great deal of time with it, in the first instance. The bird has to get used to you and its new surroundings, used to being handled and to its new ‘equipment’ - the jesses, leash and swivel. As with all birds used in falconry in the UK, Jim was bred in captivity, so he’s not ‘wild’, as such, but he was certainly untrained. It’s Steve’s role as a falconer to train Jim, to prepare him to stand on the gloved fist, to be able to hunt, or to fly to the lure. He does this by taking him out every day, sometimes just to walk with him on the glove, other times to fly with him out in the fields surrounding our base at Hammer Inn or on site, using the lure to keep Jim’s attention here. By early September, Jim was very much part of the team. Here he is (below) in the line-up of a static display at Wormistoune, where Steve did a falconry show to help with fundraising for Maggie’s Cancer charity. Jim was very steady on the block and his small size attracted a lot of attention, especially from children who thought his size made him a baby falcon. He is, in a way, having only been bred in May, but he is fully-grown, as all birds of prey are by the time they are 6-8 weeks old. When not with Steve, Jim spends a lot of time on his block. He’s tethered, of course, to stop him flying away - just as you would put a lead on a dog to stop it running off - but sitting still for hours on end and just watching is what falcons do. Birds of prey use flight as a means to escape or to hunt so one that’s fed is quite happy to sit for hours at a time, resting and not using energy unnecessarily. (It takes a lot of energy to fly!) It’s where the term ‘fed-up’ comes from: a bird that’s full (i.e. ‘fed-up’) won’t fly; it does nothing. So we say, when we’re bored and doing nothing, that we’re ‘fed up’. 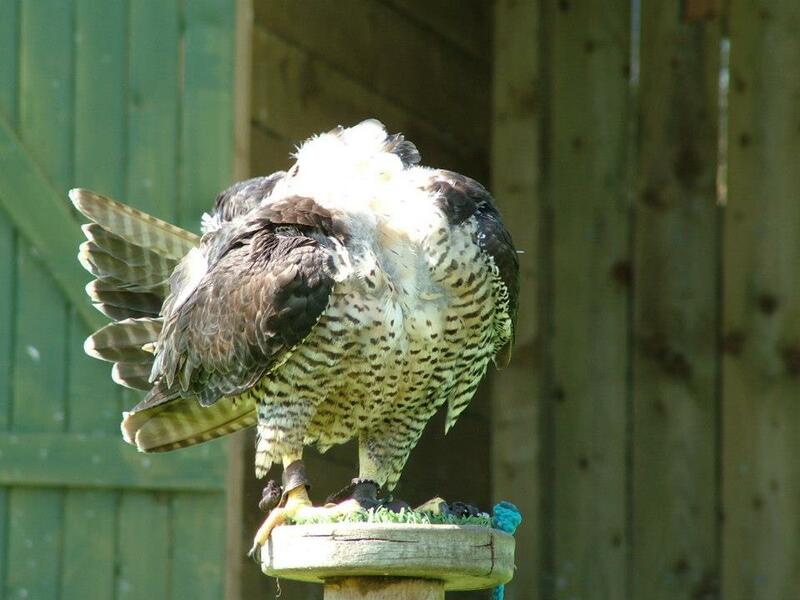 It’s an expression taken straight from falconry, like ‘under the thumb’! Anyhow, one afternoon Jim was out on his block with the rest of the team and Steve had a falconry booking that he was preparing for. He had boxed the harris hawks and hooded the falcons and walked away from the weathering area to put some rubbish in the bin. Only a minute or two later he heard Jim’s kek-kek-kek cry, and knew Jim was in distress because he was shouting very loudly - an alarm call. Steve ran back to the weathering as fast as he could. When he came round the corner of the workshop, to his horror Steve saw a large female buzzard just taking off from beside Jim’s block, leaving Jim lifeless on the ground. Steve went over to Jim and untied his leash and picked him up. Jim was completely still, and stayed limp in Steve’s hand. Distraught, Steve brought him into the house, convinced he was dead. However, once inside, Jim opened his eyes. He was breathing very heavily and clearly in distress so we thought he was dying and just held him in a blanket to keep him warm. When a bird is attacked by another bird of prey, they are usually badly injured with puncture wounds from talons, or have feather and flesh torn off by the attacker’s beak. Because Jim was lying on his front, it was difficult to see any marks on him so we couldn’t tell what damage the buzzard had done. Remarkably, within about twenty minutes, Jim started to move. We placed him inside a travel box - amazed that he could even stand - to give him a calm, quiet space to rest. But there still seemed little hope that he would recover. A female buzzard weighs about 3lbs or 1.3 kgs and is around 21 inches (55cm) tall, so that’s quite a size advantage over little Jim! Steve reckoned she’d only had half a minute or so on Jim before Steve had run back to the weathering but that’s more than enough time to have inflicted fatal damage. And if he was somehow, incredibly, not badly wounded, would Jim survive the shock? Later that evening, to our surprise and relief, Jim was still alive and Steve managed to get him to eat a little. Jim had blood on his cere (the blue bit above his beak where his nostrils (known as nares) are and he was breathing heavily so still plenty to be concerned about. However, Jim spent the night in his travel box and was still going strong in the morning. 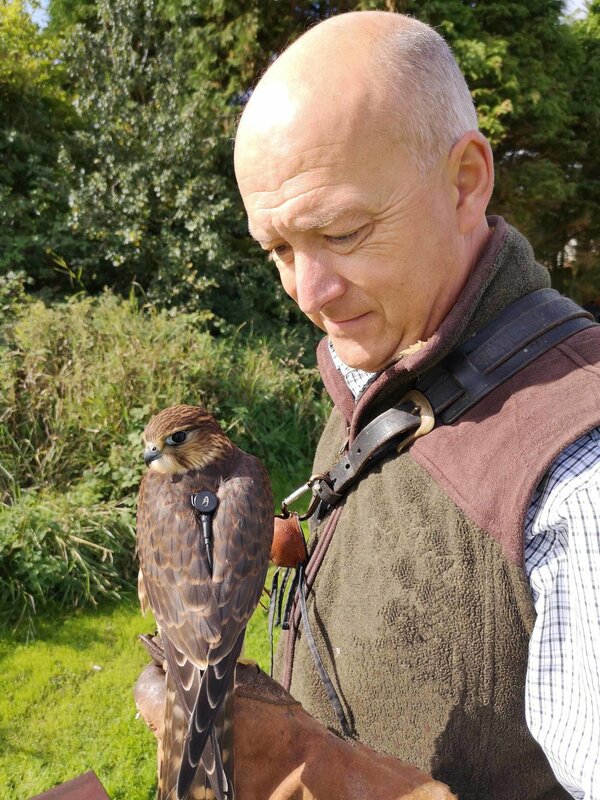 We are hugely fortunate to live near an experienced and expert falconer-vet, Keith, who practises out of the Eden Veterinary Practice at Cupar. Keith agreed to fit Jim in that morning so that he could be checked over and given antibiotics. When Steve came back with Jim later that day, we were both astounded: Keith could find no obvious signs of injury (other than the bit of blood on his cere); Jim had the laboured breathing but, otherwise, seemed fine! You can see from the video (above) how hard the buzzard whacked Jim and you can see that she pinned him down and that Jim stops moving. It looks like she held Jim by his head with one of her talons (explaining the blood on his cere) and, perhaps, that blocked his airway so that he lost consciousness. In fact, that may well be what saved Jim’s life: it may have stopped the buzzard going in for the kill because she may have thought he was already dead. Keith had said Jim was to be on antibiotics for 5 days and - if he made it to then - should be fine. He did and he is! He gained a little weight - up an ounce to 180 grams - which really made his feistiness come through, but that was the only change in him. Lucky Jim! Steve’s next job was a net job. He wanted to protect the birds when they are sitting out on the weathering lawn so he ordered some 4” predator netting (used to protect ponds from herons, and the like) and installed it across the entire weathering. It’s perfect - reassuring but not too distracting. The buzzard watched from a distant fence post while Steve put the netting up but we haven’t see her since, so hopefully she’s got the message and moved on. Jim has now fully recovered. The hunting season has passed so it’ll be next year before Jim gets to go out hunting again with Steve and Pete. He’s back in his mews at night and frequently out on his block by day, but now safe(r) under the predator netting. Jim’s definitely proved he’s a tough little bird and his resilience has been remarkable. He’s still in his first year, of course, and could live until he’s 12 - 15 years old, so we hope he’ll have many more years with us. 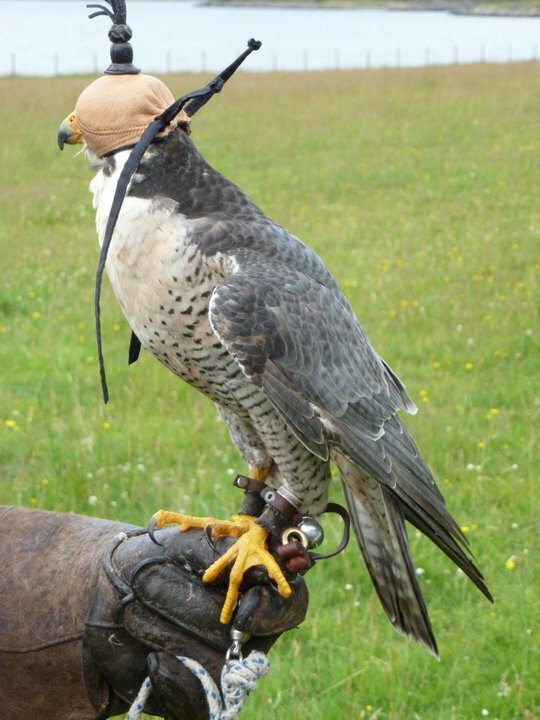 If, in time to come, you visit us for a falconry experience, I hope Jim’s still here for you to see*. And when you do, you’ll know why we might sometimes refer to our merlin as Lucky Jim. *Or not… as it turned out. I’m sorry to say that Jim died suddenly, only a couple of weeks later, and just when he seemed to be fully recovered. We reported the news on our Facebook page. Anything else you’d like to know about Jim? Or about merlins? Please ask in the comments below. Where do your birds come from? Although perhaps most famous for its peregrine falcon, it may surprise you to know that Scotland is home to more than 20 varieties of bird of prey. This series introduces you to some of the birds of prey that you can see across Scotland. This post: the white-tailed sea eagle. 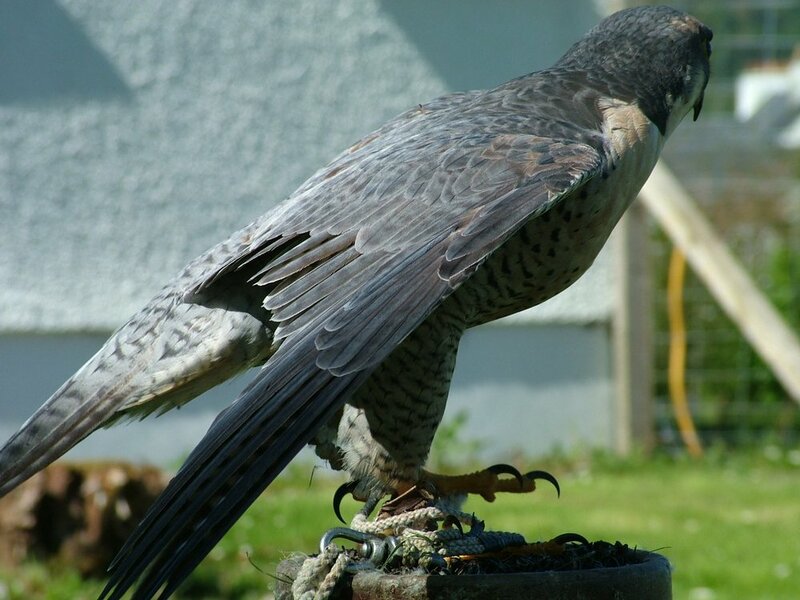 Although perhaps most famous for its peregrine falcon, it may surprise you to know that Scotland is home to more than 20 varieties of bird of prey. This series introduces you to some of the birds of prey that you can see across Scotland. This post: the merlin. If you've been following our series on what birds of prey can be seen in Scotland, you'll know that more than twenty species of raptor can be found in Scotland. Yet none of these are ever going to end up in the Inspired Falconry team, or - for that matter - any other team. Under the Wildlife and Countryside Act of 1981, it is illegal to remove any bird from the wild. Eggs, nests, birds and their habitats are all covered by the Act to ensure that our native species can thrive. 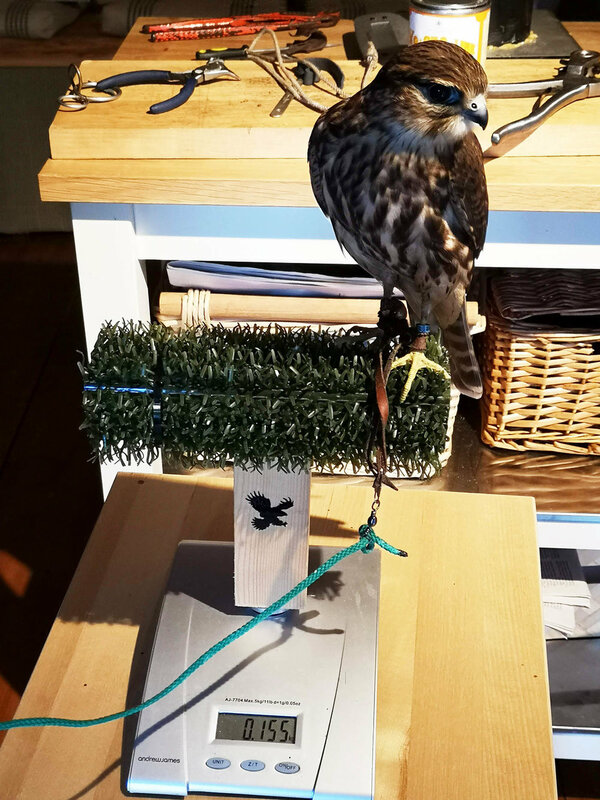 So how do falconers like Steve get their birds of prey? The answer is that all of the raptors used in falconry in the UK today are either captive-bred in this country or imported under licence. 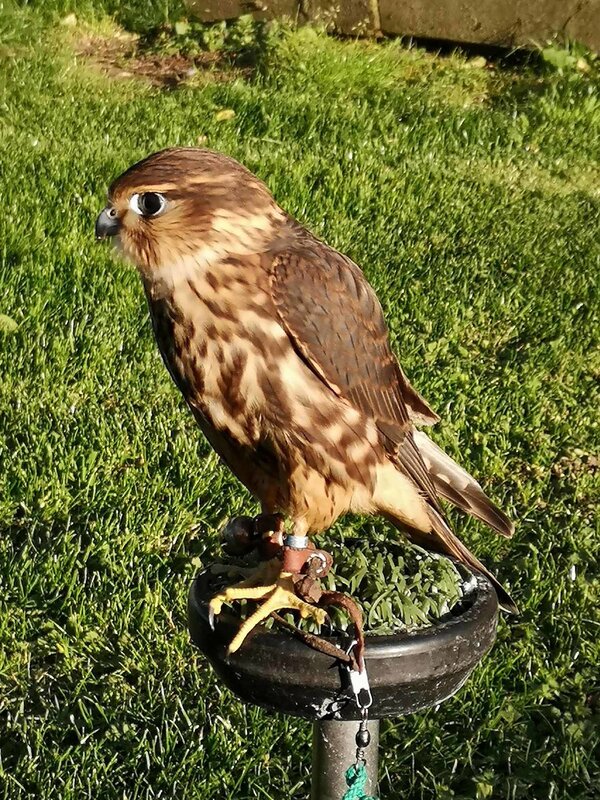 Birds of prey bought from these breeders must come with the necessary legal paperwork, which - depending on the bird and its status under the law - may simply be confirmation of origin or an Article 10, which is like a passport for a bird. 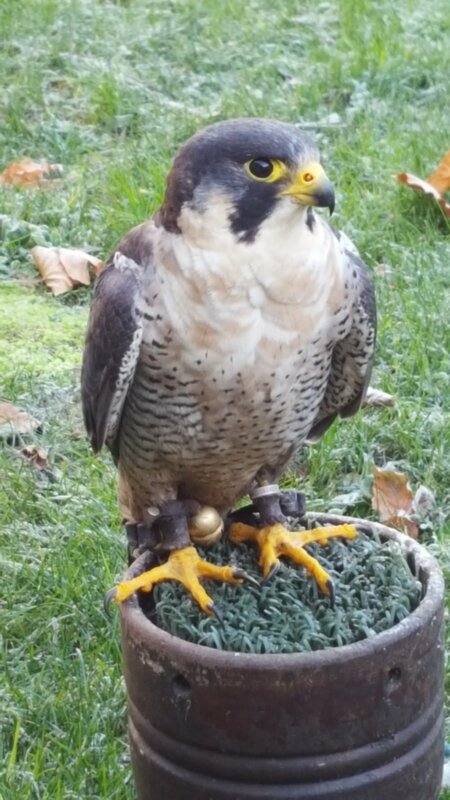 The Article 10 paperwork, for 'Schedule 4' endangered birds (9 of them, including the peregrine, merlin and golden eagle) contains information about the bird's parents and is matched with a numbered ring on the bird's leg. The Government Department for the Environment, Food and Rural Affairs (DEFRA) oversees this registration process. British captive-bred stock may stem from wild-captured birds taken under licence or before the 1981 Act. Birds are bred in captivity by dedicated, skilled falconers and breeders who have learned to replicate nature as closely as possible in order to achieve any success. Why and how did captive-breeding start? 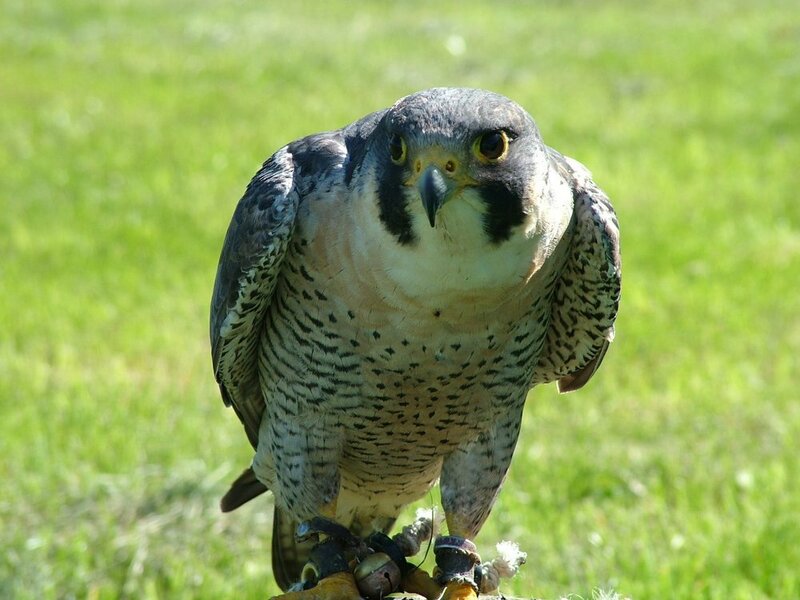 Captive breeding was initially a reaction to raptor population devastation caused by pesticides such as DDT in the 1950s. Changes in farming practices (enabled by pesticide use) and the effect of the poisons themselves decimated bird numbers during the 1960s. Prey species were drastically reduced in number and diversity and raptors' eggs were damaged by the pesticides, preventing their shells from developing properly. Raptor numbers declined sharply. 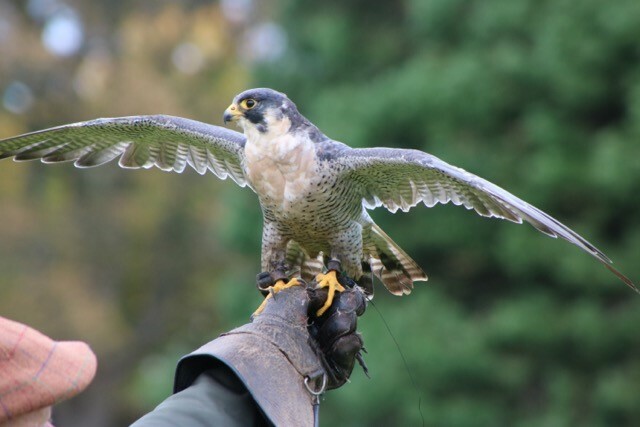 Starting with peregrines, a small number of falconers set out to breed them in captivity, helping to save and then strengthen the population over time. Captive-bred birds can be released successfully into the wild, using a process called 'hacking', which we'll cover in another post. 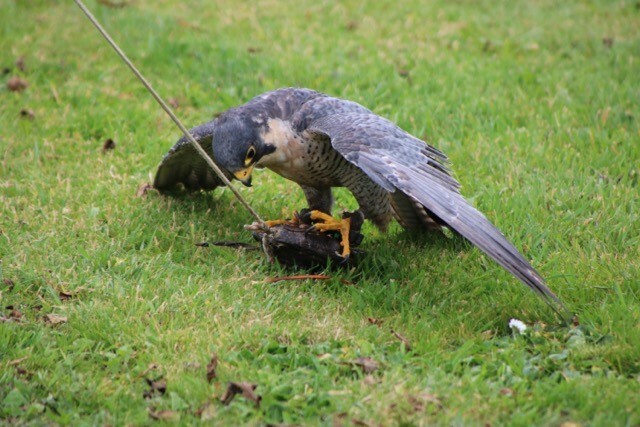 The network of UK's falconers and their mutual interests and interactions means that birds are now routinely exchanged or sold between them, depending on need and circumstances. Where a falconer can no longer provide a bird with the hunting grounds or secure mews it needs, another falconer will take on the bird instead. 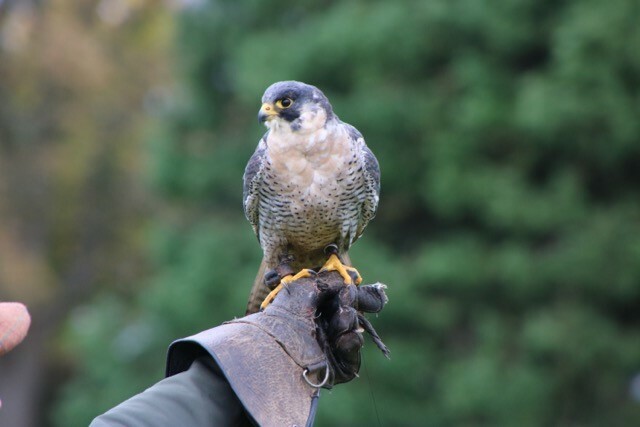 Some birds live for many years and may be retired from a breeding programme or from hunting, living out their days in more sedate places such as Falconry Centres, Owl Sanctuaries and Safari Parks across the UK. 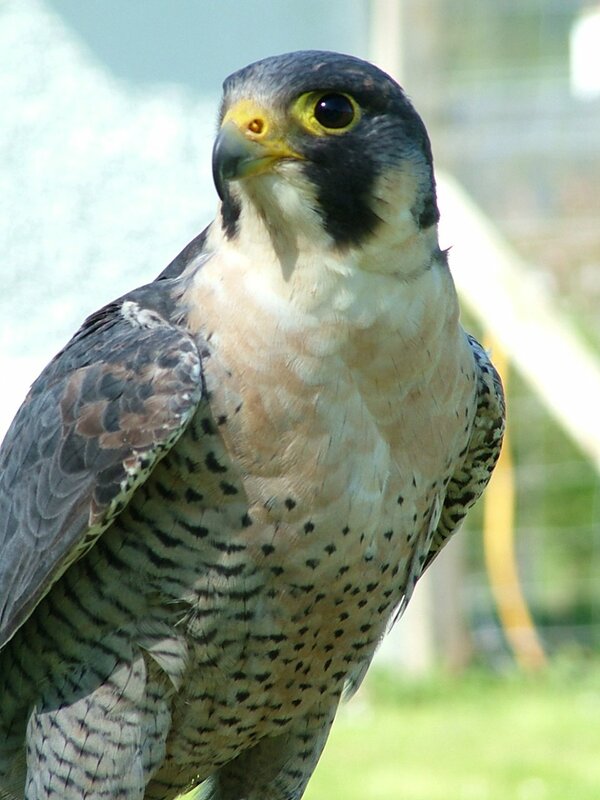 Those of you who remember Peggy, our peregrine (pictured above), may recall that she was a retired breeding bird. You can see from her really dark colouring that she's a mature female. Ailsa the Eagle Owl (below), on the other hand, was only about 4 years old (and called something else) when she was bought by Steve from friends who could no longer fly her every day. 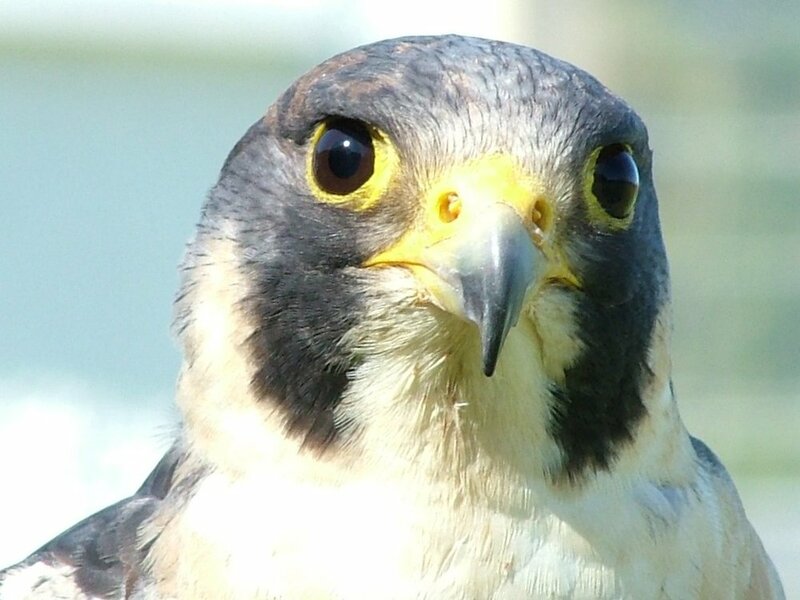 How much are birds of prey? Not that you'd ever want to buy one, unless you were highly experienced or properly trained and had the appropriate set-up, but we're often asked how much the birds are worth. The rather unsatisfactory answer is that it depends. It depends on the quality, gender, rarity, and training; it depends on the breeder and the birds' availability! It depends on what they are used for and how old they are. But, as a broad example, a mature, trained female Golden Eagle would fetch anywhere from £5,000-£7,000, whilst a male Barn Owl can be found for under £100. The cleaning bills and food preparation are a whole other story, though! 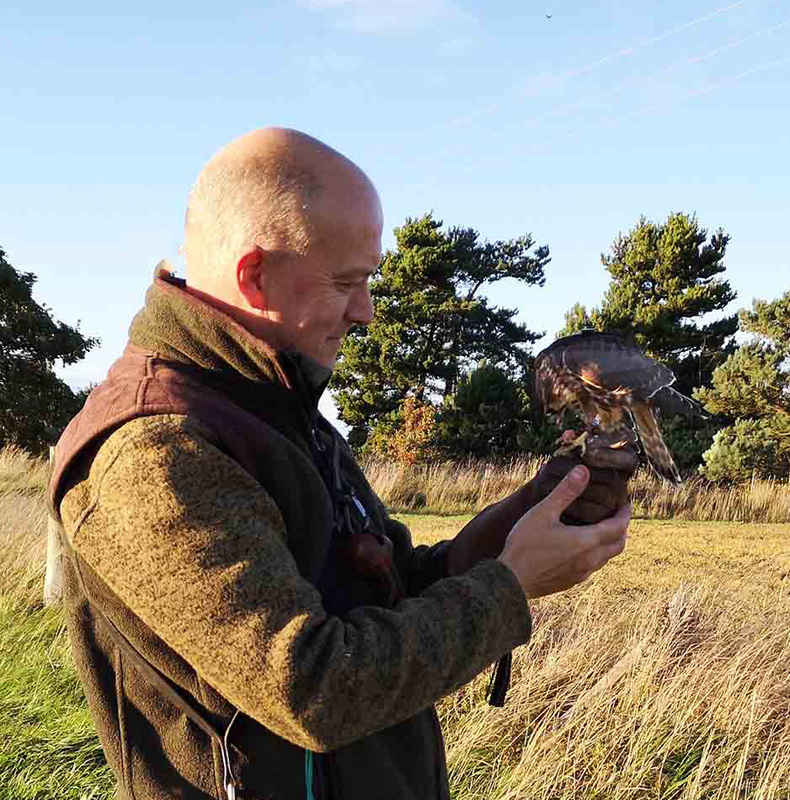 No matter where they have sourced them, falconers like Steve are passionate about birds of prey and pride themselves in their husbandry and care. It takes many hours and needs daily input to keep a bird in peak condition. A bird's condition is evident - in their eyes, their feathers, their feet and their general demeanour. It certainly affects their ability to fly or to hunt. But that's another post for another day! 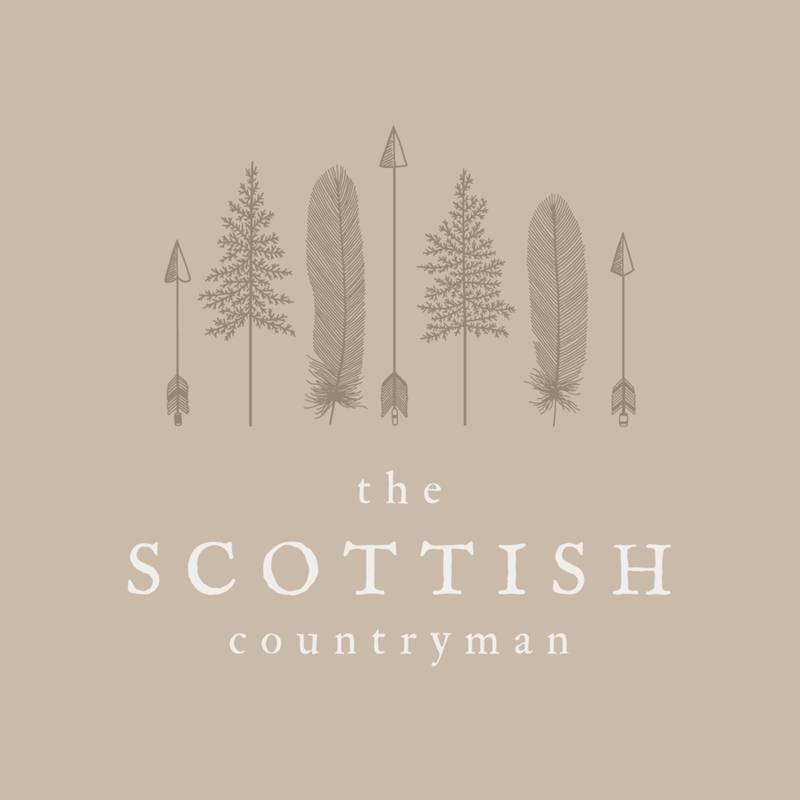 If you've enjoyed this post and would be interested in learning more about birds of prey, falconry or all things 'Scottish Countryman, please subscribe to The Scottish Countryman's blog. If you have an idea for a future blog post, or just a falconry-related question you've always wanted to ask, please let us know. Spam free, guaranteed! We respect your privacy and won’t sell your details. 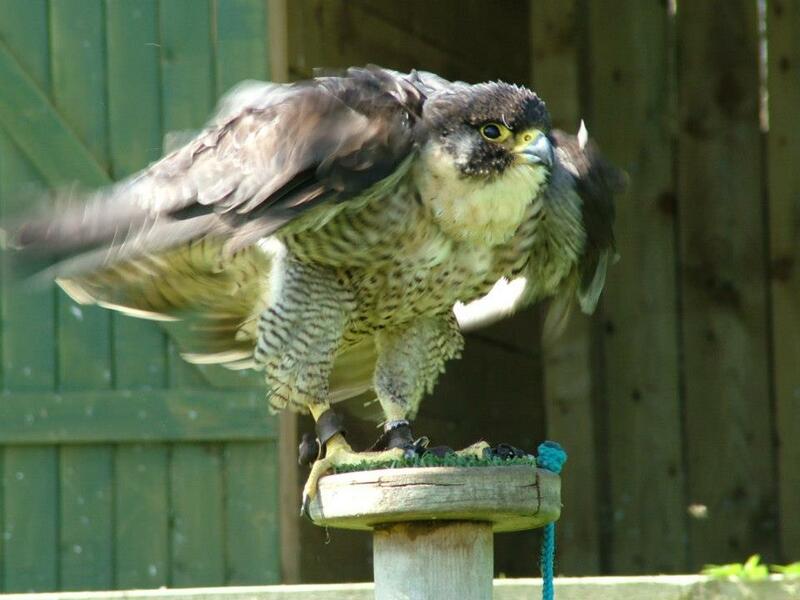 If you'd like to experience birds of prey up close, why not book a Bird of Prey Experience with us? 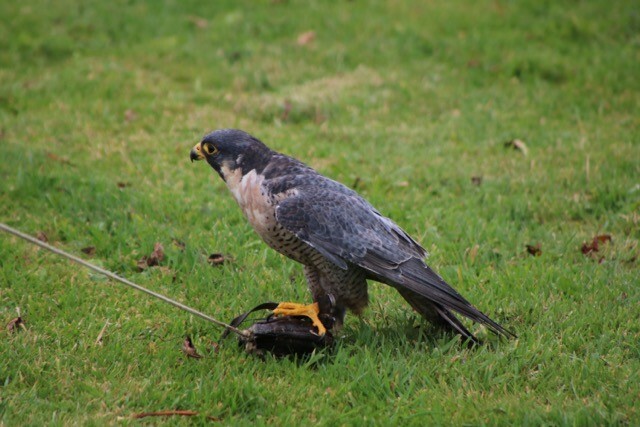 Want to know what others thought about their bird of prey experience? Read the reviews about Steve and his captive-bred birds. Although perhaps most famous for its peregrine falcon, it may surprise you to know that Scotland is home to more than 20 varieties of bird of prey. This series introduces you to some of the birds of prey that you can see across Scotland. This post: the red-tailed kite. Although perhaps most famous for its peregrine falcon, it may surprise you to know that Scotland is home to more than 20 varieties of bird of prey. This series introduces you to some of the birds of prey that you can see across Scotland. This post: the tawny owl. Although perhaps most famous for its peregrine falcon, it may surprise you to know that Scotland is home to more than 20 varieties of bird of prey. This series introduces you to some of the birds of prey that you can see across Scotland. This post: the sparrowhawk.